Welcome to the heart and soul of Barton Visions. 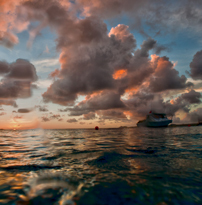 Capturing the beauty of the oceans is what drives the creative content of all the other services we provide. While we specialize in underwater photography, we have some galleries of land-oriented shots as well. In addition, our in-house professional photography services gives you access to entirely original and unique images on your website. We can photograph your buildings, staff and any other objects or landscapes that express your identity, products and services. The core of this piece is a South Pacific pink anemone. The shot was from 2007 and started out as smaller tiled pieces. This final image is sized to be 5' by 3' and mounted on a custom piece of frosted acrylic. This piece has sold. 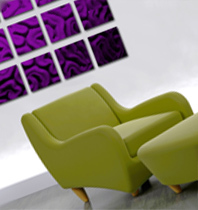 Purple brain coral design. This is truly a digital creation. I loved the texture of the brain coral, but made a series of several colors. This was derived from an underwater photo of the brain coral. which was a fairly large organism. It was roughly 5' to 3' foot diameter. Our custom wall fountains feature the fine art photography of Patrick Barton. This piece represents a single example, but the possibilities are endless. Please contact us today and let us create a custom and unique piece that fits your style. These fountains were inspired to bring the fresh sense of the aquatic world to any environment. Perfect for Interior spaces of homes, yachts, commercial spaces or a design can be tailored to any outdoor area.